An Addys Mercedes concert is a journey between the sun and the moon, yesterday and today, serious moods and lightheartedness. The big voice of Cuba liberates the music of her homeland from its dusty image, putting aside the clichés of fat cigars, singing grandfathers and loose young women, leading us instead into a world of uninhibited high spirits and deep melancholy. Her well-known hits like “Rompe el Caracol” and “Vive La Vida” conjure up dancing through summer nights. Songs like “Nada”, in which she addresses the subject of social inequality, bring out the thoughtful side in her, while “Sabado Roto” is about having the winter blues in Europe. However, the highlights of her concerts are the quiet moments in wonderful ballads such as “Atrapa Los Sueños” or “Doña Rosa”. The diva who performs in major concert halls uses her warm and expressive voice to reveal subtle and delicate nuances. Her new album “Extraña” deals with the feeling of being different. In the title song she asks people in her adopted country Germany, “Why am I a stranger to you? After all, the tree in your garden and the wine on your table come from far away. What are you afraid of?” And she tells us how she adapts life in Europe to her taste by acting spontaneously, and adding a pinch of spicy Cuban pepper “Aji Cachucha”. In her preceding album, which was nominated for the German Record Critics’ Award, she built a bridge to her Cuban homeland with the fictional “Locomotora a Cuba”. The Cuba Addys Mercedes left behind as a young woman is now following the progress of her art in the diaspora with a mixture of amazement, pride, and curiosity. 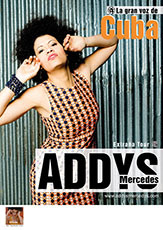 An evening with Addys Mercedes is above all things an encounter with a woman who is warm-hearted and approachable. She tells touching tales about her eventful journey through life, from her humble beginnings in the Cuban countryside to renowned concert halls and festivals with such legendary musicians as Eric Clapton, Bob Geldof and Ringo Starr. Her 16-year-old daughter Lia is now a member of the family band; she divides her life between school and musicianship, studying classical violin and going on tour with the band.